I’ve got another delightful recipe to share with you. 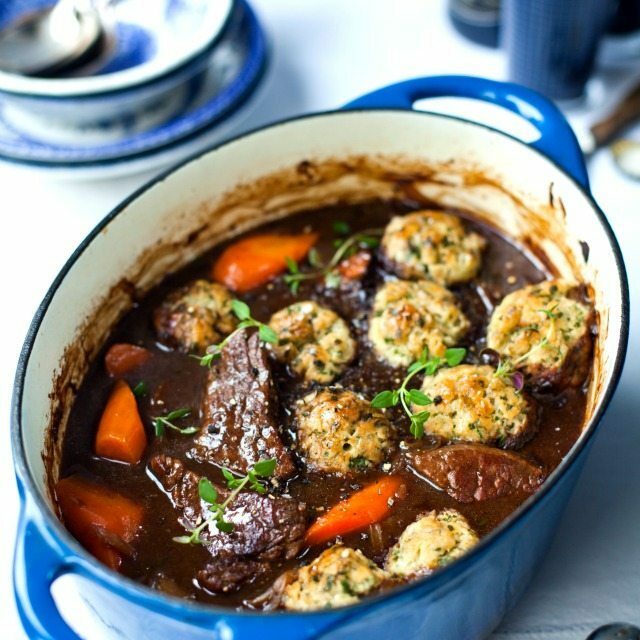 Today we’ll be cooking braised stout beef and carrot stew with parsley dumplings, a dish that just perfect for this season. It will warm you up for sure and it’s really tasty. This is one of those dishes that are pretty easy to make and easily impress. Start by preheating the oven to 160ºC. Heat a heavy-based casserole dish with a lid on the hob, add a tablespoon of oil and when it starts smoking, add the beef. Brown on all sides and transfer to a plate with a slotted spoon. Set aside. dd a tablespoon of oil into the pan, add onions and cook for about 5 minutes or until golden, occasionally stir. Add the thyme and cook for a minute. Sprinkle in the flour and cook over a low heat for another minute or two, stir constantly. Slowly pour in the stout or Guinness and stir until smooth after each pour. Add the stock, season lightly and stir to combine. Add sugar, vinegar and carrots. Bring all to the boil and remove from the heat. Tip in the beef you have set aside earlier and mix it well. Cover it with a lid, transfer to the oven and cook for about 1 hour or until the beef is almost tender and the liquid is reduced and thickened. Now, let's make the dumplings. Mix flour, seasoning and herbs in a bowl. Then mix in the suet. Add 6 tablespoon of cold water to make elastic but fairly stiff dough that leaves the bowl clean. Knead it gently and shape into 12 dumplings. Take the stew form the oven and take off the cover. Increase the heat of the oven to 200ºC and pop in the dumplings. Return the stew to the oven for another 30 minutes or until the dumpling are golden brown. Hmmm. Wow. That dish looks so yummy and healthy. Still good for diet, yeah?